Our evidence-based analysis on creatine features 73 unique references to scientific papers. Vitamin K is poorly understood, both by the general public and among health professionals. It has a wide range of potential benefits, but their nature and extent are still uncertain. Some vitamins are more popular than others. In the past, a lot of research went into vitamin C, which became a popular supplement. Nowadays, a lot of research goes into vitamin D, whose popularity as a supplement is steadily growing. By contrast, research on vitamin K is still scarce, having slowly developed over the past two decades. Further, it is scattered, because there exist several forms of vitamin K. Some of those forms are present only in a few foods. Others exist in various foods, but only in minute amounts. Few have been the subject of human trials. Of the four fat-soluble vitamins (A, D, E, and K), vitamin K was discovered last. In 1929, Danish scientist Henrik Dam discovered a compound that played a role in coagulation (blood clotting). When he first published his findings, in a German journal, he called this compound Koagulationsvitamin, which became known as vitamin K.
Today, we know that vitamin K participates in some very important biological processes, notably the carboxylation of calcium-binding proteins (including osteocalcin and matrix GLA protein). In other words, vitamin K helps modify proteins so they can bind calcium ions (Ca2+). Through this mechanism, vitamin K partakes in blood clotting, as Henrik Dam discovered, but also of calcium regulation: it helps ensure that more calcium gets deposited in bones and less in soft tissues, thus strengthening bones and reducing arterial stiffness. 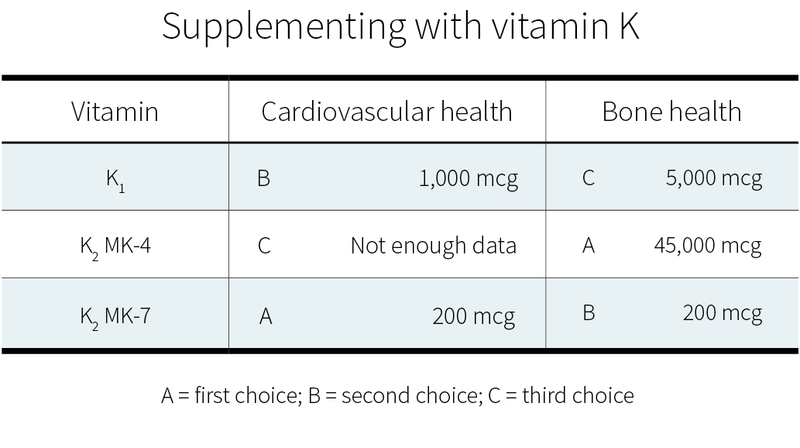 What complicates matters is that each vitamin has different forms, called vitamers, each of which may affect you differently. Vitamin K has natural vitamers, K1 (phylloquinone) and K2 (menaquinone), and synthetic vitamers, the best-known of which is K3 (menadione). K1 is produced in plants, where it is involved in photosynthesis: the greener the plant, the greater its chlorophyll content; the greater its chlorophyll content, the greater its K1 content. When it comes to foods, K1 is especially abundant in green leafy vegetables. K1 makes for 75–90% of the vitamin K in the Western diet. Unfortunately, K1 is tightly bound to chloroplasts (organelles that contain chlorophyll and conduct photosynthesis), so you could be absorbing very little of what you eat — maybe less than 10%. Since vitamin K is a fat-soluble vitamin, however, its absorption can be enhanced by the co-ingestion of fat: adding fat to cooked spinach can raise K1 bioavailability from 5% to 13%. Things become more complicated here, because just as there are several forms of vitamin K, there are several forms of vitamin K2. To be more precise, the side chain of K1 always has four isoprenoid units (five-carbon structures), so there is only one form of K1, but the side chain of K2 has n isoprenoid units, so there are n forms of K2, called MK-n. Whereas the side chain of K1 has four saturated isoprenoid units, the side chain of K2 MK-4 has four unsaturated isoprenoid units. Although K1 is directly active in your system, your body can also convert it to MK-4. How much gets converted depends notably on your genetic heritage. MK-4 is present in animal products (meat, eggs, and dairy), though only in small quantities. Because those foods usually contain fat, dietary MK-4 should be better absorbed than dietary K1, but future studies will need to confirm this hypothesis. Other than MK-4, all forms of K2 are produced by bacteria. Your microbiota was once thought to produce three-fourths of the vitamin K you absorb. Vitamin K, however, is mostly produced in the colon, where there are no bile salts to facilitate its absorption, so the actual ratio is probably much lower. Bacteria-produced K2 can be found in fermented foods, such as cheese and curds, but also in liver meat. The richest dietary source of K2 is natto (fermented soybeans), which contains mostly MK-7. As it stands, MK-7 is the only form of K2 that can be consumed in supplemental doses through food (i.e., natto). For that reason, MK-7 is the most-studied form of K2, together with MK-4. K1 and MK-4 both have a side chain composed of four isoprenoid units; their half-life in your blood is 60–90 minutes. MK-7 has a side chain composed of seven isoprenoid units; it remains in your blood for several days. Due to their different side-chain lengths, the various forms tend to be transported on different lipoproteins, which are taken up at different rates by various tissues. K1 and MK-4 are used quickly (K1 in the liver, MK-4 in other specific tissues), whereas MK-7 has more time to travel and be used throughout the body (which makes it, in theory, the best option for bone health). 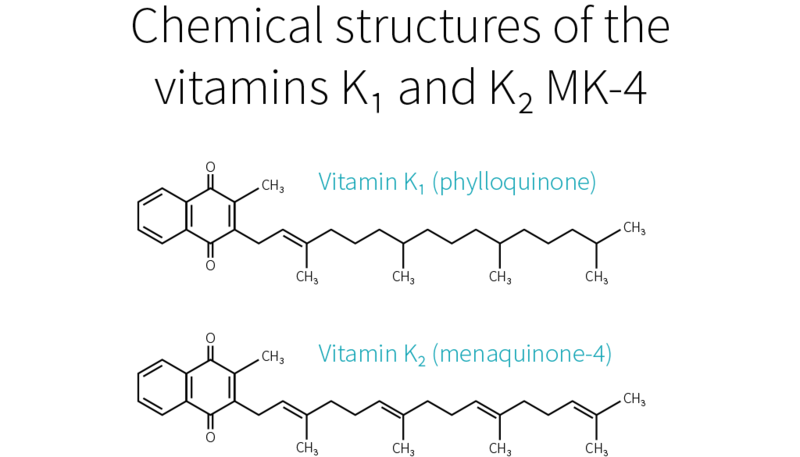 K1 and K2 are the only natural forms of vitamin K, but there exist several synthetic forms, the best known of which is K3. However, whereas the natural forms of vitamin K are safe, even in high doses, K3 can interfere with glutathione, your body’s main antioxidant. K3 was once used to treat vitamin K deficiency in infants, but it caused liver toxicity, jaundice, and hemolytic anemia. Nowadays, it is used only in animal feed, in small doses. In the animals, vitamin K3 gets converted into K2 MK-4, which you can consume safely. Vitamin K is a family of fat-soluble vitamins. K1 and K2, the natural forms, are safe even in high doses. There is only one type of K1; it is found in plants, notably green leafy vegetables; your body can use it directly or convert it to K2 MK-4. Aside from MK-4, all other types of K2 are produced by bacteria, including the bacteria populating your gut. MK-4 is present in animal products (meat, eggs, dairy), whereas other types of K2 can be found in fermented foods and liver meat. As far as we know, vitamin K mainly affects blood clotting, vascular and heart health, and bone health. Epidemiological studies have mostly focused on K1; cardiovascular trials, on K1 and MK-7 (the main type present in natto, the richest dietary source of K2); bone trials, on MK-4 (the type of K2 your body can make out of K1). Vitamin K deficiency impairs blood clotting, causing excessive bleeding and bruising. It is rare in adults, but more common in newborns (more than 4 cases per 100,000 births in the UK), where it can result in life-threatening bleeding within the skull. For that reason, the American Academy of Pediatrics recommends that newborns receive K1 shortly after birth (intramuscular injections have shown greater efficacy than oral administration). If you suffer from hypercoagulation (if your blood clots too easily), you might be prescribed a vitamin K antagonist (VKA), such as warfarin, a medication that hinders the recycling of vitamin K. Some doctors recommend that VKA users shun vitamin K entirely, but preliminary evidence suggests that, under professional supervision, vitamin K supplements might help stabilize the effects of VKAs. Which form should be supplemented, though, and in what amount, is still uncertain. There is some evidence that K1 enhances coagulation more than does MK-4 but less than does MK-7. With regard to daily supplementation, 100 mcg of K1 is considered safe, but in some people 10 mcg of MK-7 is enough to significantly impair VKA therapy. Remember that natto is rich in MK-7. A single serving of natto can increase blood clotting for up to four days, so it is one food VKA users should avoid. Other foods should be safe to eat. Please note that in people who do not suffer from hypercoagulation, and thus do not need to medicate with VKA, high intakes of natto have never been correlated to excessive blood clotting. Similarly, human studies saw no increase in blood-clot risk even from 45 mg (45,000 mcg) of MK-4 taken once or even thrice daily. As we saw, vitamin K partakes in calcium regulation: it helps ensure that more calcium gets deposited in bones and less in soft tissues, thus reducing arterial stiffness. This is why people who take vitamin K antagonists, such as warfarin, are more likely to suffer from vascular calcification. Epidemiological studies and mechanistic evidence suggest that dietary K2 benefits cardiovascular health more than an equal dose of dietary K1. 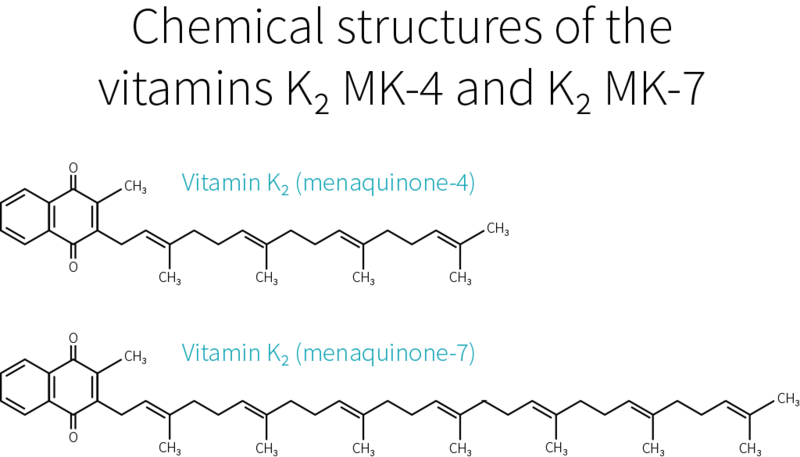 Clinical trials on supplemental vitamin K have focused on K1 and MK-7. 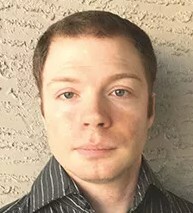 Often, those trials used a combination of vitamin D and other nutrients, but with vitamin K being the key difference between the intervention group and the control groups. Both of these forms of vitamin K seem to cause a consistent reduction in arterial stiffness (with better evidence for MK-7), and less consistent reductions in coronary calcification and carotid intima-media thickness. Judging from those trials and the epidemiological evidence, MK-7 seems the better choice. As we have just seen again, vitamin K partakes in calcium regulation: it helps ensure that less calcium gets deposited in soft tissues and more in bones, thus strengthening the latter. This is why people who take vitamin K antagonists, such as warfarin, might be more at risk of bone fractures, though not all studies agree they are. MK-7 appears to support the carboxylation of osteocalcin (a major calcium-binding protein in bones) more efficiently than K1. Clinical trials suggest that, for the purpose of increasing bone density, MK-4 and MK-7 work more reliably than K1. More significantly, a meta-analysis of MK-4 trials found an overall decrease in fracture risk. The effect of K1 or MK-7 supplementation on fracture risk is less clear. Only one K1 trial looked at fracture risk; it reported a decrease, but without a concomitant increase in bone mineral density. Of the two MK-7 trials, one reported no difference in the number of fractures between the placebo group and the MK-7 group, whereas the other reported fewer fractures in the MK-7 group; there were, however, no statistical analyses for either study. More research on vitamin K and fracture risk will be needed to clarify the effects of the different forms at different dosages. Currently, if you wish to supplement for bone health, a very high dose of MK-4 (45,000 mcg) is the option best supported by human studies. Those studies, all in Japanese people, focused on the prevention of bone fractures, and yes, much smaller dosages can probably help support bone health; but how much smaller? In a 12-month study, 20 patients suffering from a chronic kidney disorder were given a daily glucocorticoid (a corticosteroid that has for side effect to decrease bone formation and increase bone resorption). In addition, half the patients received 15 mg of MK-4 daily, while the other half received a placebo. The placebo group experienced bone-density loss (BDL) in the lumbar spine, while the MK-4 group did not. More recently, a 12-month study in 48 postmenopausal Japanese women gave 1.5 mg of MK-4 daily to half of them and found a significant reduction in forearm BDL, but not in hip BDL, and it didn’t evaluate fractures. So there is some evidence for dosages lower than 45 mg/day. It is, however, a lot weaker. In healthy people, vitamin K supplementation does not increase the risk of blood clots. 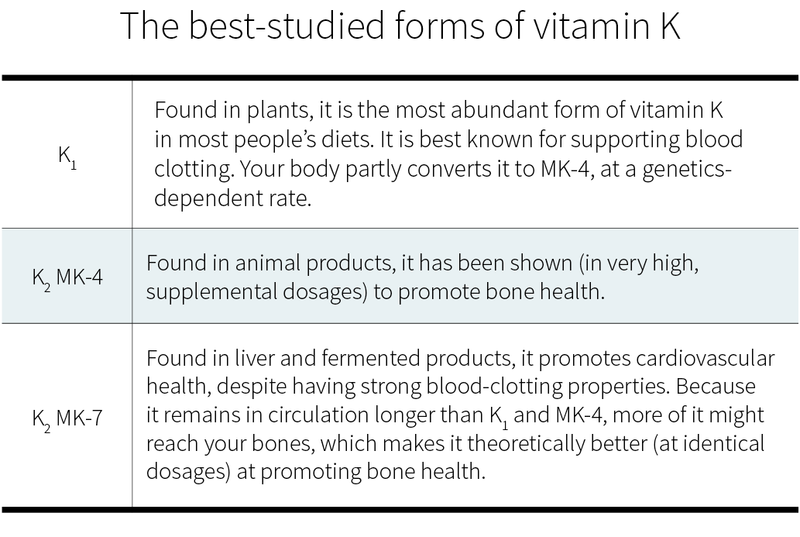 Judging from limited evidence, MK-7 seems to be the best form of vitamin K for cardiovascular health, and MK-4 the best form of vitamin K for bone health. Since vitamin K is crucial to your health, why is it the subject of relatively few studies? One of the reasons is simply that vitamin K deficiency is very rare in healthy, well-fed adults. It is mostly a concern in newborns, in people who have been prescribed a vitamin K antagonist, in people who suffer from severe liver damage, and in people who have problems absorbing fat. Vitamin K is abundant in a balanced diet, and the bacteria in your colon can also produce some. Moreover, your body can recycle it many times, and this vitamin K-epoxide cycle more than makes up for the limited ability your body shows for storing vitamin K.
Still, you can recycle vitamin K many times, but not forever, and so you still need to consume some regularly. But how much, exactly? No one knows. There is, as yet, not enough evidence to set a Recommended Dietary Allowance (RDA) for vitamin K, so an Adequate Intake (AI) has been established at a level assumed to prevent excessive bleeding. In the United States, the AI for vitamin K is 120 mcg/day for men and 90 mcg/day for women. In Europe, the AI for vitamin K is 70 mcg/day for men and women. More recent research, however, suggests that those numbers should be increased. Since 100 g of collards contain, on average, 360 mcg of vitamin K, getting enough vitamin K looks easy. But can’t you just as easily get too much? Fortunately, no. Though allergic reactions have occurred with vitamin K injections, no incidence of actual toxicity has ever been reported in people taking natural vitamin K, even in high supplemental doses. For that reason, neither the FDA nor the EFSA has set a Tolerable Upper Intake Level (UL) for vitamin K. One should note, however, that we lack long-term, high-dose studies on vitamin K safety. K1 can be found in plant products, notably green leafy vegetables. K2 MK-4 can be found in animal products (meat, eggs, and dairy). The other types of K2 can be found in fermented foods and liver meat. Meats’ vitamin K content correlates positively but non-linearly with their fat content and will vary according to the animal’s diet (and thus country of origin). Forms of K2 other than MK-4 and MK-7 have not been well studied but are likely to have some benefit — cheeses and beef liver are notable sources of others forms of K2 and cheese consumption is associated with a reduced risk of cardiovascular disease. While well-conducted controlled trials provide the most reliable evidence, most such trials used amounts of vitamin K2 that far exceed what could be obtained through foods, save for natto. This leaves us wondering if dietary K2 has any effect. Fortunately, it seems to be the case: a high dietary intake of K2 (≥33 mcg/day seems optimal) may reduce the risk of coronary heart disease — an effect a high dietary intake of K1 doesn’t appear to have. It doesn’t mean, of course, that foods rich in K1 are valueless: dietary K1 intake will protect you from excessive bleeding and is inversely associated with risk of bone fractures. Although much more research needs to be performed, there is early evidence that vitamin K, whether in food or in supplemental form, can benefit cardiovascular health and bone health. If you’d like to peruse the full body of research, our vitamin K page has over 450 references. If you are interested in an a step-by-step, evidence-based approach to supplementation, then check out our Stack Guides.